The American Trauma Society, in collaboration with the Society of Trauma Nurses, is once again pleased to present National Trauma Awareness Month. 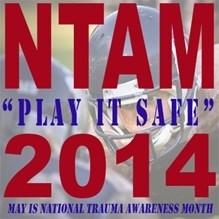 This May, National Trauma Awareness Month celebrates its 26th anniversary with the campaign slogan, “Playing It Safe” will focus on Sports Injuries. In recent years, increasing numbers of people of all ages have been heeding their health professionals’ advice to get active for all of the health benefits exercise has to offer. But for some people—particularly those who overdo or who don’t properly train or warm up—these benefits can come at a price: sports injuries. We hope the campaign and its materials will continue to draw attention to these issues and invoke change by the community. We are proud to continue the annual tradition of National Trauma Awareness Month during the month of May. ATS has posted this year’s campaign materials electronically for your use, not only for May, but also in the months thereafter. We also encourage trauma centers to have a “trauma survivors’ day” to reunite patients and families who have been served by the trauma center. Visit the ATS web site for the materials to plan the celebration. Click on “Programs”, and then National Trauma Awareness Month.